India has around 200 ports (all inclusive). Each port, based on traffic it handles, has one to many container yards. Containers from ships are loaded onto trucks to be dumped in the yard. The stackers in the yard, stack them randomly based on their arrival. These containers have to be transported to their respective destinations again by trucks or trains. As it can be seen from the video, as the containers are frequently shuffled by the stacker, it becomes a real challenge for someone to locate a container. bring down the search time with the help of a GPS tracking system. develop a low-cost alternative to DGPS. After brainstorming, we came up with a Wifi GPS. As we have to make this wifi gps in India to suit Indian market, we went on to assemble and test it. This wifi-gps would sit on the stacker to trace the stacker movement. The operator of the stacker would feed the information of the container either manually or on auto-mode. For auto-mode this circuit can be fixed with an imaging sensor or a RFID reader. 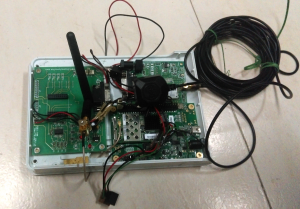 Location will be captured from GPS and is transmitted to a central server using the wifi antenna. At the server, search can be performed for a container and location ( with a 2-5 meter error) of the container can be given as a printed map to the customer. Though this circuit works fine at lab conditions, we felt need for certain improvements when we tested this near a port in India. This has to be in a rugged case for rough sea weather conditions. GPS accuracy can be improved with technologies like assist gps or gogps. We are yet to deliver this solution in the market but we see a huge potential for this solution in all the major ports of India.